SCVHistory.com DI2813 | St. Francis Dam Disaster | West Abutment & Wing Dike, 1928. 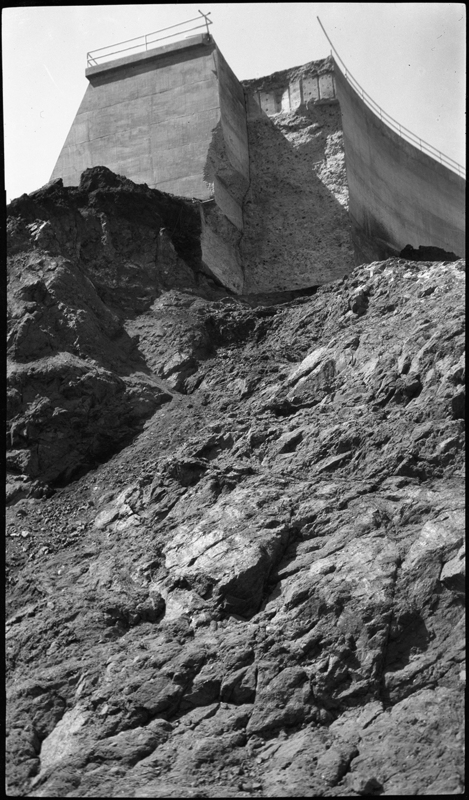 Looking up at the west abutment and wing dike, from the broken base of the St. Francis Dam. 4x6-inch BW film transparency (larger than 4x5). Date, photographer and original purpose of photograph unknown. Compare to this series of images. DI2813: 9600 dpi jpeg from original 4x6-inch transparency purchased 2015 by Sharon Divis. Transparency and 1.7GB archival scan on file.